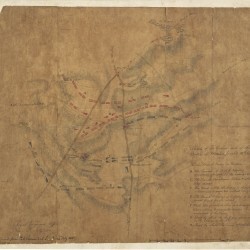 FIRST OFFICIAL SKETCH OF THE FIELD OF THE BATTLE OF WATERLOO. SURVEYED BY THE ROYAL ENGINEERS TWO DAYS AFTER THE BATTLE WHILE THE WOUNDED LAY ON THE GROUND. 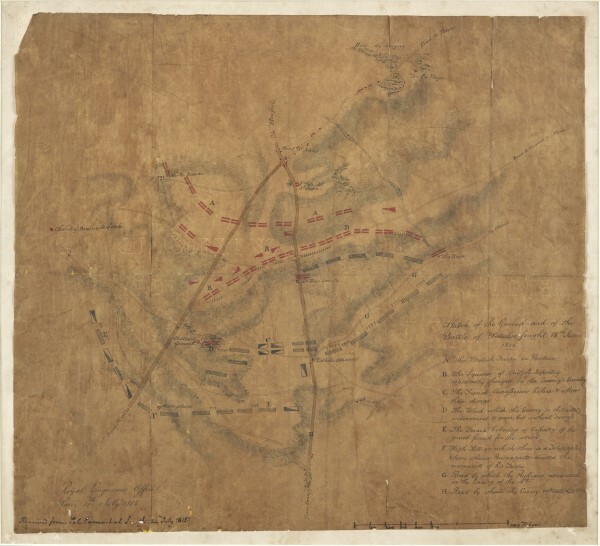 Exceptionally rare MS coloured and annotated Sketch of the Ground and of the Battle of Waterloo fought 18th June 1815 surveyed on 20th June 1815 by Captain Alexander Thompson R.E. and Lieutenant Francis Gilbert R.E. Dimensions approx. : 370mm x 400mm. Dated: Royal Engineers Department, Paris, 11th July 1815. Presented to an unknown recipient on 24th July 1815 by Colonel Sir John Carmichael-Smyth, the duke of Wellington’s commanding royal engineer at the battle of Waterloo. In a diary entry for 20th June 1815, two days after the battle of Waterloo, Major John Oldfield R.E. recorded how his fellow engineers’ ‛Capt. A. Thompson & Lieut. Gilbert were sent to make a plan of the field of battle’. [i] Oldfield, Thompson and Gilbert were three of just ten royal engineers who had been present at the battle under command of Colonel Sir John Carmichael Smyth. Smyth and his officers had previously hastily assembled a map of Belgium which Wellington consulted during the battle. Known as the “Waterloo Map”, it is now a most precious relic of the action and key exhibit of the Royal Engineers Museum, Chatham. Thompson and Gilbert faced appalling scenes as they surveyed the four square miles of the recent battle in the hot summer sun. ‛Many of the wounded [were] still on the ground’ wrote Oldfield, ‛and piles of dead bodies which rendered the smell intolerable’. Many corpses were already stripped naked by looters and among them stood or galloped terrified horses. The drawing they prepared described the general landscape of the battlefield and illustrates the deployment of the French and British armies throughout the day. The French columns, which attacked the static British squares, are illustrated in two positions linked by broken lines to illustrate the ebb and flow of the action. The topography is illustrated with careful shading and cross hatching. Wellington reached Paris on 7th July 1815, three weeks after his triumph at Waterloo. Napoleon had abdicated as emperor on 22nd June, leaving Paris on 25th in the hope of fleeing to the United States. Wellington, now leading an army of occupation, had established command headquarters at Gonesse about ten miles north east of the centre of Paris. It was here that Thompson and Gilbert completed the sketch ahead of its engraving for wider circulation. Two MS versions of the original sketch survive: the current example and another in the Board of Ordnance collection at the National Archives (ref: MPH 1/387/1). It appears the basic outline of the original sketch was copied using a portable pressing copying machine. 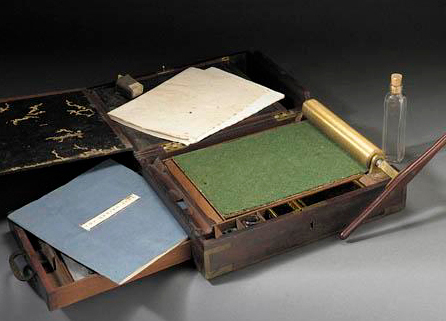 First developed in the late 1770’s by James Watt in partnership with Matthew Boulton, then improved and made portable by James Watt Jnr, the copying machine offset a written document by pressure onto thin, translucent unsized paper to produce a reversed copy from the back. The paper of both surviving drawings is watermarked: ‛Prepared copying paper J.Watt, Soho, Staffordshire’. The two surviving sketches differ in detail from each other and substantially from the final engraved edition. Reversed by the copying process, so that British positions appear at the top, they also have a narrower focus limited, no doubt, by the scope of the copying machine. It is also obvious that much of the detail―and all the text and colouring―was added by hand in ink after the copy process. This suggests that only the key geographical features of the original sketch, such as road layout and landscape, were press copied by Thompson and Gilbert, presumably to save time. They then added most of the detail again by hand. Roads are clearly marked, woods drawn and coloured, and the landscape littered with now-familiar and famous landmarks such as Napoleon’s headquarters at La Belle Alliance and the fiercely contested settlements of La Haye Sainte and Chateaux Goumont (now Hougoumont). When complete, the sketch was titled and a key added before it was sent to an engraver, presumably in Paris, for publication. Accordingly all three surviving versions: the later engraved example and the two pressed MS copies differ in the arrangement of the opposing armies. These variations offer vivid insight into the evolution of an ‛accepted’ view of the battle. The Board of Ordnance version at the National Archives, which is currently undergoing conservation ahead of its display for the Waterloo Bicentenary, is annotated with Thompson and Gilbert’s names. The same hand has apparently added details of the presentation of this example by Colonel Smyth himself to an unknown recipient. His endorsement further enhances the importance of the sketch and its remarkable survival as a documentary relic of the battle of Waterloo. Purchased by a UK private collector. On loan to the Royal Engineers Museum, Chatham for display from 10 June 2015.